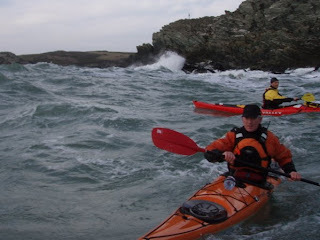 Turning the boat through wind and waves - from sheltered area RJ & PW paddled parallel to the waves with speed in order to perform upwind turns. 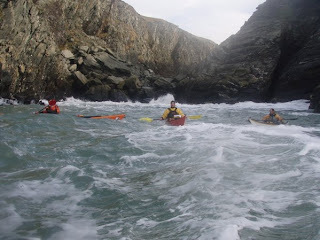 They were encouraged to paddle through the swell with power before slowing down. Downwind turns where performed with wave & wind direction towards the shore. Encouraged to think about using wave or surf assistance for quicker crosswind turns. PW & RJ looked at turns using outside edge, i.e., edging into the wave (cf bongo sliding in surf); with forward sweep and return with low brace thus maintaining a balanced, stable position ready to brace if necessary. Suggested they look in direction of turn to position body for maximum trunk rotation. On reflection, whilst using this technique RJ does not shown sufficient commitment in rough water. What RJ gained from observation and instruction during this session is the importance and confidence of quality strokes, i.e., a positive commitment to the edge and paddle. Got RJ & PW to examine their stern rudder in the surf using positive blade positioning. 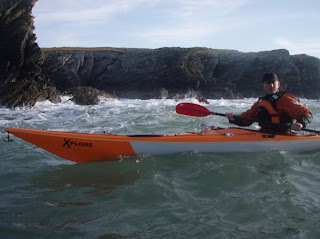 PW should try to keep paddle deep, ‘fixing’ the blade in the water during both powerful forward paddling and during sweep strokes. Use rear boat quarter only for reverse sweep (after which sweep becomes reverse paddle stroke). Complete turn using powerful body ‘crunch’ and allow stroke to transfer to low brace (stable, less risk of shoulder damage, more flexible than high brace). 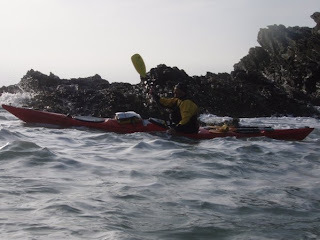 Paddling downwind and following sea; efficient forward paddling - Got PW & RJ to consider positioning feet together (if possible), to sit upright ('go tall') and use good trunk rotation. Also go them to look forward to horizon. They practiced using power and sweep strokes only for correction. 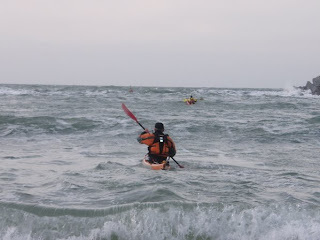 This was a downwind / wave exercise (cf techniques and exercises performed paddling into wind on the first Llandudno session).